At an inn which opens only on holidays, a crooner and a hoofer vie for the affections of a beautiful up-and-coming performer. Long a Christmas-time favorite of mine, 1942’s Holiday Inn provides the first of only two occasions on which Bing Crosby and Fred Astaire worked together, with 1946's Blue Skies as the other instance. I never saw the second movie but I doubt it lives up to this one. Inn tells the story of two entertainers: singer/dancer Jim Hardy (mostly singer Crosby) and dancer/singer Ted Hanover (mostly dancer Astaire). Those two and dancer/singer Lila Dixon (Virginia Dale) do an act together, but this will soon end since Jim and Lila plan to marry and retire to farm life. Or maybe not. It turns out that Ted wooed Lila on the side, and they've decided to stick together as a couple. Once the bomb drops on sad-sack Jim, he heads off to his estate alone and spends some time as the gentleman farmer. Eventually Jim gets an idea for a new business: the Holiday Inn. This establishment will put on shows for each of the dozen or so holidays per year. While he scouts for talent, Jim meets Linda Mason (Marjorie Reynolds) and she joins him for the performances. Inevitably, love ensues, and so do the old competitive challenges once Ted loses Lila and meets Linda. Confused yet? It's actually all quite simple, though it sounds like a convoluted soap opera. The only important concerns stem from the Jim/Lila/Ted triangle, and those are easy to follow. In the end, it all seems almost irrelevant, since the plot exists just to pursue a basic love story and also to toss in some songs. As a business proposition, the Holiday Inn sounds like a loser - no way they make enough money to support the project based on so few shows a year, especially since the elaborate performances look expensive - but it gives the filmmakers an excuse to stage said complicated numbers. Though I don't care for this kind of material in general, the showtunes work fairly well here. They're good enough that even a musical-hater like myself got a kick out of some of them. Inn is the answer to one of the most common movie trivia questions. The song "White Christmas" debuted here, not in the film White Christmas as so many assume. Less well known is the fact that "Easter Parade" - another tune that inspired a movie - also made its initial appearance in Inn. Actually, those two famous songs offer some of the least interesting production moments in the film, though "White Christmas" is used for good emotional effect. Probably the best number is the one for the Fourth of July, which features Astaire's "improvised" firecracker dance. It's inspired stuff and remains very entertaining. That statement applies to the film as a whole, as it's a charming tale that benefits mightily from the chemistry between the two stars. They're both likable as well as entirely believable as friendly rivals, and their interactions are memorable. The men make their potentially bland characters more interesting and lively than the roles deserve. Inn contributes a surprising amount of solid humor as well. Most modern movies don't make me laugh, and the giggles come even more infrequently in romantic films like this. However, Inn gets in some good moments, such as Astaire's attempt to graciously accept Crosby's gift of homemade preserves ("Why they're great on... or even alone"). It's not a laugh-riot, but it offers enough funny material to sustain my attention and interest. The only genuinely negative aspect of the film stems from differences in cultural sensitivity between 1942 and today. Let's just say the racial stereotypes in Inn are pretty thick. Not only does Jim have a sassy black "mammy" named Mamie who runs his kitchen, but also the musical number for Lincoln's Birthday features all the white performers heavily done up in black-face make-up! This effect is outdone only by the snippet in which - incongruously, since she's not part of the production - Mamie sings the following line to her children: "When black folks lived in slavery/Who was that set the darky free?" Oh, my! However, I won't come down too hard on the movie because of the differences in the culture. Believe it or not, I'll bet this kind of material was actually regarded as progressive at the time. Hey, at least Inn presents the freeing of slaves as a positive, unlike Gone With the Wind. That film actively mourns the death of the antebellum South and all its "quaint" customs. Despite those dated aspects, Holiday Inn remains a winning film, mainly due to charming performances from its leads. The movie provides a lot of good comedy, romance and songs, and it works well enough to tame even a musical-hating beast like myself. 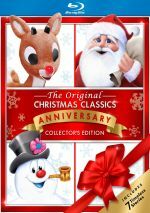 Plus, since it includes so many different holidays, it's the one "Christmas movie" you can watch anytime and not feel like an idiot! Holiday Inn appears in an aspect ratio of 1.33:1 on this Blu-ray Disc. Despite some ups and downs, the transfers seemed mostly acceptable given its age. For the most part, sharpness appeared good. Although some shots presented a bit of softness – especially during the scene when Jim slathered Linda in blackface – the majority of the flick came across as reasonably well-defined. I noticed no jagged edges or shimmering, but edge haloes were an issue. These could be moderately prominent throughout the film and they caused some distractions. Print flaws were a mild issue at most. I noticed a couple of small marks but nothing persistent or major. Black levels appeared good through the flick, as it boasted deep tones as well as nice contrast as well. Low-light shots also offered good clarity for the most part. While parts of the image worked well, the overall impression remained inconsistent. As for the DTS-HD MA monaural soundtrack of Holiday Inn, it seemed fine for its vintage. Music lacked much range but showed fairly good clarity. Effects felt about the same, as though elements showed reasonable definition. Though they failed to demonstrate oomph, they gave us accurate enough material. Speech fell along the same lines. The dialogue came across as a bit tinny, but this information demonstrated listenable, intelligible speech. All of this gave us a soundtrack that worked acceptably well for its age. How did this 2017 “75th Anniversary Edition” Blu-ray compare to the prior Blu-ray from 2014? Both were identical – literally, as the 2017 disc simply reissued the old one. This means all the extras on Disc One repeat those from the prior release, and these start with an audio commentary from film historian Ken Barnes. He offers a running, screen-specific chat, but he doesn’t go it alone. Along the way, we hear some archival notes from actors Bing Crosby and Fred Astaire and conductor John Scott Trotter. Most of the material comes straight from Barnes, though, as the audio clips from the others are rare. Barnes covers many topics. 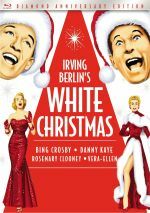 He starts with a look at the project’s origins and development before he provides notes about story ideas, music and performances, cast and crew, specifics about “White Christmas” and its impact, the film’s era and social context, its reception, competition and legacy. That’s a lot, and Barnes makes this a fine discussion. My only complaint comes from the amount of dead air, as Barnes goes silent a little too often, especially during the film’s second half. However, the quality of the content more than compensates for those gaps. We get a surfeit of excellent details. Barnes sings us the original first verse of “White Christmas”, interprets the blackface number as part of its era, and even explains the confusing Thanksgiving gag during which a cartoon turkey jumps from one Thursday to another. Despite the dead air, Barnes offers a genuinely terrific commentary. In addition to the film’s trailer, we find a pair of programs. A Couple of Song and Dance Men runs 44 minutes, 35 seconds. It mixes movie clips, archival materials and comments from Barnes and Fred Astaire’s daughter Ava Astaire McKenzie. They discuss the lives and careers of Astaire and Crosby. The format seems a little awkward, as it often feels like McKenzie and Barnes just lecture each other; it doesn’t always comes across like a conversation and it can be weird. Nonetheless, plenty more good information develops here, and the archival elements prove winning. Yeah, the program occasionally comes across like annotated filmographies of Crosby and Astaire, but the conceit works. We learn a lot and see plenty of fun clips to flesh out the package. All-Singing, All-Dancing goes for seven minutes, 15 seconds and features narration from Barnes as he discusses the evolution of singing and dancing in films. Barnes goes through techniques used over the years and discusses how movies captured these elements. Barnes proves informative as always in this informative little piece. The Blu-ray also includes a colorized version of Holiday Inn. As I mentioned when I reviewed It’s a Wonderful Life, I have zero use for colorized editions of black and white movies, so I won’t evaluate the tinted Inn. If it interests you, though, go for it! We also find a featurette called Colorizing a Classic. This eight-minute, 51-second piece includes Legend Films COO/founder Barry Sandrew, production director Jane Huizenga, lead designer Marsha Navarro, Edith Head’s sketch artist Jan Mucklestone and Legend VP of Operations Susan Olney. As expected, this show looks at the work involved with the colorized Inn. Though I don’t care for colorized movies, this piece gives us a nice look at the efforts involved. New to the 2017 “75th Anniversary” release, we get a second disc with Holiday Inn: The Broadway Musical. This runs two hours, two minutes and give us a stage-bound version of the movie. On the positive side, this Inn doesn’t offer a literal retelling of the movie. It follows the basic plot/character points but it comes with a mix of changes as well as a variety of songs not found in the film. Of course, the stage show also jettisons the movie’s racially insensitive elements. That means no “Abraham” and no Mamie, as a spunky, wisecracking red-haired caretaker replaces her. Unfortunately, the Broadway Inn lacks any of the movie’s charm, and its actors fail to display personality or charisma. Maybe the show works on stage, but viewed on TV, it seems campy, dull and forgettable. 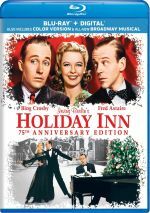 Though known best as a Christmas movie, Holiday Inn works all year-round and consistently entertains. The delightful pairing of Bing Crosby and Fred Astaire helps make this a classic. The Blu-ray offers acceptable picture and audio with some decent supplements. I’d prefer a stronger transfer, but this nonetheless becomes the best home video rendition of a fun film, and the added Broadway stage version adds some value.